Since I am frequently asked what to pack, and have quite a few weekend getaways planned for this summer, I am going to share my packing essentials with you for a variety of destinations. This weekend I am off to one of my favorite places close to home. The Chesapeake Bay. 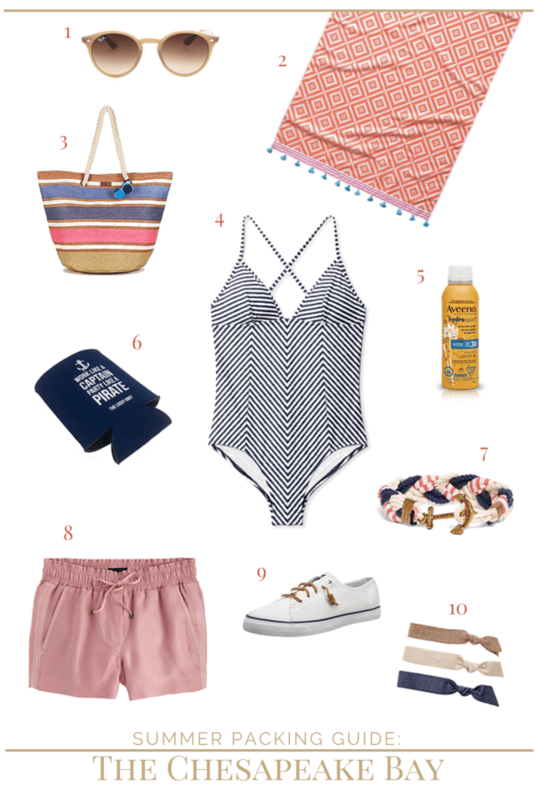 You can find a more comprehensive packing list for your weekend getaway here. Then, simply add my favorite bayside essentials listed below. You’ll be good to go! 1. Sunglasses // Always required for sunny summer days on the water. 2. Beach towel // This one is functional and adorable. Plus it rolls up to fit in a tote. 3. Tote // Packed with a towel, sunscreen, koozie, beverage(s) of choice and lots of snacks. 4. One-piece swimsuit // So you can jump in the water without losing your top. 5. Sunscreen // Sprays on and it’s waterproof! Aveeno is perfect for my sensitive skin. 6. Koozie // To keep your favorite beverage cold. 7. Nautical bracelet // I stick to just one or two accessories when I pack for the weekend. 8. Drawstring shorts // With a one-piece you don’t need a full cover up. 9. Slip-on boat shoes // I tend to go barefoot but it’s always nice to start out with a good pair of shoes. 10. Hair ties // The wind can really pick up so bring along a few hair ties and all the ladies will be thanking you.